The spark of life barely flickers in his brain. His ancestors walked in the shadow of dinosaurs and mingled with horses that grew only 12 inches tall. Slow, clumsy and low on the intelligence scale, the opossum is an ancient mammal and seems destined to follow us to the stars. The adult opossum (Didelphis marsupialis) weighs about seven pounds. It's face is elongate, narrow and coneshaped. The opossum has black, hairless ears that are leathery in texture and tipped in pink or white. Their tales are naked and scaly, and their feet are shaped like hands. Dense underfur is white with grayish tips, and the guard hairs are dark gray or black, but from a distance, opossums appear grayish in color. Some individuals may have underfur tipped in brown, and these animals will have a brownish cast rather than gray. The opossum has black, beady eyes set in the whitish head, and the feet are black with pink or white toes. The inner toe of each hind foot is like a thumb. An albino variation is not an uncommon sight. The albino varieties will have pink eyes, and white ears and feet. The female opossum has a woolly pouch on her abdomen for carrying and nourishing her newborn young. The skull of the opossum belies its ancient lineage because it contains 50 teeth, the most of any US mammal. The breeding season for opossums begins in February. Young are born within two weeks after mating. From 10 to 20 offspring leave the birth canal and crawl to the female's pouch. Helpless and less than an inch long, the offspring struggle to gain possession of one of the 13 teats contained in the pouch. The successful young remain attached to the teats for a month before they begin to leave the pouch for short periods. As they continue to grow, they are forced to abandon the pouch, and the mouse sized youngsters retreat to the mother's back, often clinging to her tail as she wanders in search of food. Litters are not produced at any particular time but are born over a relatively long period from early spring into summer. Females can produce two litters per year. The young remain with the female for about three months. The final litter of the season may be traveling with the female when the first litter of the next year is born. Opossums were once uncommon in northern portions of the United States. In the past half-century, opossums have extended their range and are now found in Canada. These animals occur in each county of Indiana, but their numbers can be reduced in northern tier of counties due to severe winter conditions. It is not uncommon to find individuals with tips of their ears and tails blunted from frostbite following a harsh winter. Aside from the overwhelming reproductive powers, a reason for opossum survival is their ability to eat nearly anything, vegetable or animal, in any state of decomposition. They serve as scavengers, thriving on foods discarded or rejected by other animals. Opossums eat eggs and young of fellow creatures and occasionally kill sleeping poultry and ground nesting birds. These items are rounded out with nuts, acorns, persimmons and corn. They do not hibernate, but amble forth in search of food on cold, winter nights. Few night hunters go out with their faithful hounds in search of opossum. Some, however, are encountered in search of more appealing game. Most opossums taken by hunters are harvested by raccoon or fox hunters. Opossums have some value as furbearers, and a good number are sold each year for their pelts. 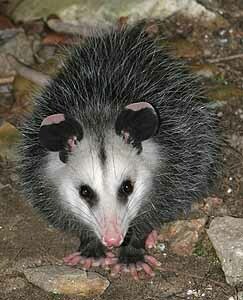 Those who have tried eating roasted opossum find their flesh tasty, so some end up in a roasting pan each season. Occasionally, opossums are captured during fur season in sets designed for other furbearers. This is especially true if a strong smelling lure or decayed meat is used as bait. Since little effort is required in pelting opossum, most trappers add them to their trapline catch as a bonus. Opossums, because of their wide variety of eating habits, do not require special management techniques. Protection from hunting and trapping during closed season enables them to continue to exist at abundant levels. They have few natural predators. Dogs, foxes and owls will prey upon them, but the opossum's reproductive capabilities overcome any losses. Their slow travel pattern across highways probably spells doom to more opossums than any other adversity. The combined hunter/trapper take poses no threat to the statewide population.